LogicMonitor is a cloud-based, efficient monitoring platform that allows companies to swiftly and cost-effectively track the performance health of their IT infrastructure, enabling them to do preemptive and remedial measures to avoid escalation of issues. LogicMonitor is designed for tech professionals and IT experts involved in troubleshooting, maintaining, and managing networks, cloud services and storage, and servers and data hubs, among others. Aside from giving you a snapshot of your infrastructure’s overall performance, the LogicMonitor dashboard also serves as a gateway to your company’s in-depth reporting, alerts customization, as well as other services. Your information technology team faces a lot of tech overload; this is why they need to handle an ever-increasing array of critical applications. 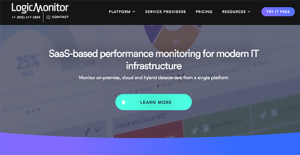 LogicMonitor is the solution: an automated monitoring platform that allows you to quickly and cost-effectively evaluate the performance of your company’s complete infrastructure (which includes public and private clouds as well on-site stacks). LogicMonitor is for businesses that are trying very hard to scale their IT capacity and efficiency through automation, and those that want to monitor Cloud, co-located, as well as on-premise infrastructure to improve uptime and end-user satisfaction. The solution tracks issues for web-based companies, cloud providers, MSPs, and in-house IT departments. ActiveDiscovery™ automated detection, management, and configuration with built-in best practices that can save tons of engineering hours. Hybrid Monitoring – Top of the line SaaS offering to monitor on-site, co-lo, or cloud. Comprehensive device coverage — Just a single solution to track everything. Combine point solutions and even break down monitoring silos. Built-in intelligence capacity plus dashboards, interactive graphs, and reports. Since each company has specific business needs, it is sensible for them to refrain from seeking a one-size-fits-all perfect software solution. Needless to say, it would be pointless to try to find such an app even among widely used software platforms. The smart thing to do would be to list the various vital factors that need consideration such as main features, finances, skill levels of workers, company size etc. Then, you should do your groundwork thoroughly. Read some LogicMonitor reviews and look into each of the other systems in your shortlist in detail. Such comprehensive groundwork can make certain you weed out ill-fitting platforms and select the system that provides all the features you need for business success. We realize that when you make a decision to buy Network Management Software it’s important not only to see how experts evaluate it in their reviews, but also to find out if the real people and companies that buy it are actually satisfied with the product. That’s why we’ve created our behavior-based Customer Satisfaction Algorithm™ that gathers customer reviews, comments and LogicMonitor reviews across a wide range of social media sites. The data is then presented in an easy to digest form showing how many people had positive and negative experience with LogicMonitor. With that information at hand you should be equipped to make an informed buying decision that you won’t regret. What are LogicMonitor pricing details? What integrations are available for LogicMonitor?